Israeli soldiers invaded, on Sunday at dawn, Khirbit al-Hadeediyya area, in the Northern Plains of the occupied West Bank, searched homes and abducted two Palestinians. The soldiers also invaded Bethlehem, and summoned three for interrogation. Media sources in Jenin said several army vehicles surrounded Khirbit al-Hadeediyya, before storming and searching many residential tents and sheds, and abducted two siblings. The sources said that the two siblings have been identified as Moath Abdul-Rahim Bisharat, 27, his brother Sakhr, 17. 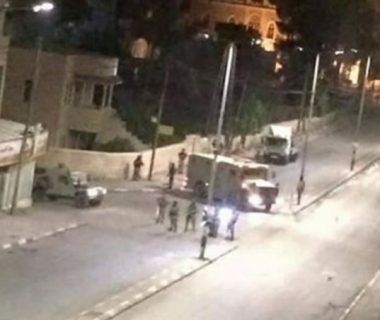 Furthermore, the soldiers invaded Bethlehem city, in the West Bank, searched homes and summoned Ismael Kamel al-Kamel, 29, from the Saff Street area, in the center of the city, and Hamza Salman Obeyyat, 28, from Hindaza area, east of Bethlehem, for interrogation in Etzion military base and security center. Another Palestinian, identified as Ahmad Shanayta, 38, was also summoned for interrogation in Etzion, after the soldiers invaded and searched his home in al-‘Obeydiyya town, east of Bethlehem.